The FEC wants your opinion on transparency for online political ads. 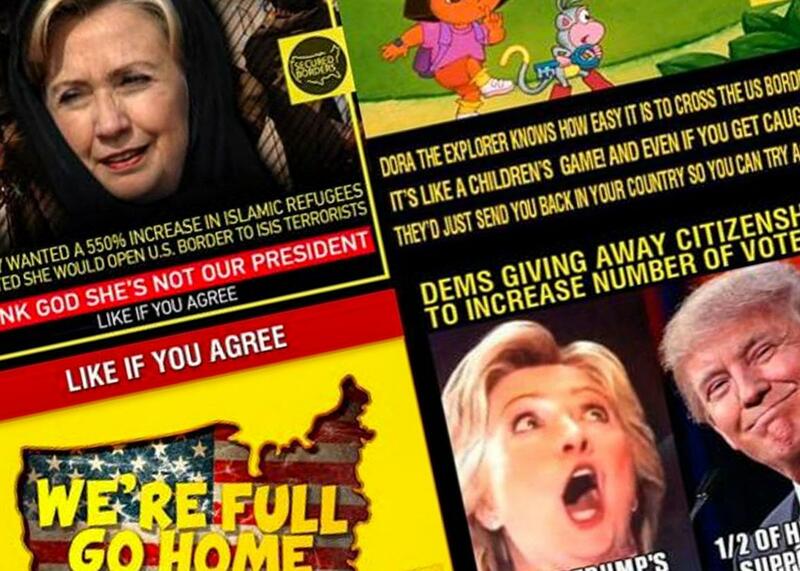 Suspicious Facebook ads from the 2016 campaign. Photo illustration by Slate. Photos from Facebook. When you see an ad on Facebook in the run-up to an election intended to sway your vote, there’s a strong chance you have no idea who paid to put it there. Now, the Federal Election Commission is taking baby steps to change that by exploring how the government could strengthen regulations around political advertisements that saturate the internet before a major election. Right now, such disclaimers are required for ads in newspapers or on television, as well as some ads on websites—but not all. Thanks to exceptions that Google and Facebook argued for, ads below a certain, strict character limit don’t have to include the disclaimer. Now the FEC is looking into the possibility of how that disclaimer requirement for pithy online ads might be updated. In 2010, Google argued that many of the political ads it runs should be exempted as “small items”—similar to a bumper sticker or a text message—that aren’t subject to the same disclosure rules. At the time, its ads allowed for just 95 characters. For comparison, text messages only have to include the disclosure if they include more than 160 characters. The FEC was split on the decision, and Google was ultimately allowed to run its brief election ads without adding a disclaimer. Instead, the FEC decided that the Google ads would link to a landing page with a disclaimer. So, you’d have to click to find out who paid for the ad. Then in 2011, Facebook decided to try to take the exception a step further, arguing that small online election ads shouldn’t even be required to include a link to a landing page with a disclaimer. Once again, the FEC was left in a 3–3 hung vote split on party lines, with the three Democratic commissioners voting against Facebook’s proposal. So Facebook basically assumed that it would face no penalties for running ads without links to disclaimers since half the commissioners would oppose enforcement, former FEC Commissioner Ann Ravel explained in an interview with Slate in September. In light of recent allegations involving 2016 presidential campaign ads bought by Kremlin-backed forces, the FEC decided to take up the case again in an open agency meeting last month. After sharing that Russian government–backed groups appeared to have purchased political ads on Facebook, CEO Mark Zuckerberg announced that his company would begin to require disclaimers on political ads voluntarily. In other words, Facebook said that it would regulate itself, thus nullifying any need for the FEC to update its fast-aging online election ad rules. But Trevor Potter, a former Republican FEC commissioner, said that the FEC shouldn’t let Facebook dictate the parameters of the federal rules that are supposed to regulate the company. “For years, Facebook has pressured the FEC not to extend existing disclaimer requirements to online political ads, which helped create the secrecy that gave rise to foreign interference in the 2016 elections,” said Potter, who is now president of the Campaign Legal Center, a group that advocates for campaign finance reform, in a statement issued after Zuckerberg shared Facebook’s plan for self-regulation. The FEC opened the same rule-making procedure around online election ad disclaimers last year, but it only received six comments, “all but one of which supported updating the disclaimer rules,” according to the FEC’s own description. And the agency didn’t take any action. (For perspective, the network neutrality rulemaking at the Federal Communications Commission received millions of comments.) But this time, there may be a significantly larger pool of feedback for the FEC to consider, since it appears that Facebook and Google’s software-reviewed ad programs opened the doors for foreign spending in the election last year in ways that may have had a serious impact on the outcome of the 2016 election. The Senate Intelligence Committee has invited Facebook, Google, and Twitter to a public hearing scheduled for Nov. 1 to answer questions about how their platforms were abused by reportedly Russian operatives to confuse voters and stoke political divides. That hearing may shed light onto how Americans were actually influenced by noxious ads Russian trolls bought to run on their platforms. And Congress could certainly step up and require a disclaimer rule for online political ads and override the chance of the FEC issuing another split vote. There’s legislation in the works now, detailed by Democratic Sens. Mark Warner and Amy Klobuchar last month, that could do just that. But their bill would only cover ads bought by an entity that spends more than $10,000 on online ads. In September, Facebook said that of the $100,000 likely Kremlin-backed political ads it ran last year, 50 percent cost the advertiser less than $3, and for 99 percent of the ads, less than $1,000 was spent. Which means that lots of small groups could still be able to buy plenty of ads without much scrutiny. The pubic has until Nov. 9 to submit comments to the FEC about whether internet companies should be required to include a disclaimer on election ads about who paid for them. If you want to speak up, visit the FEC’s website.